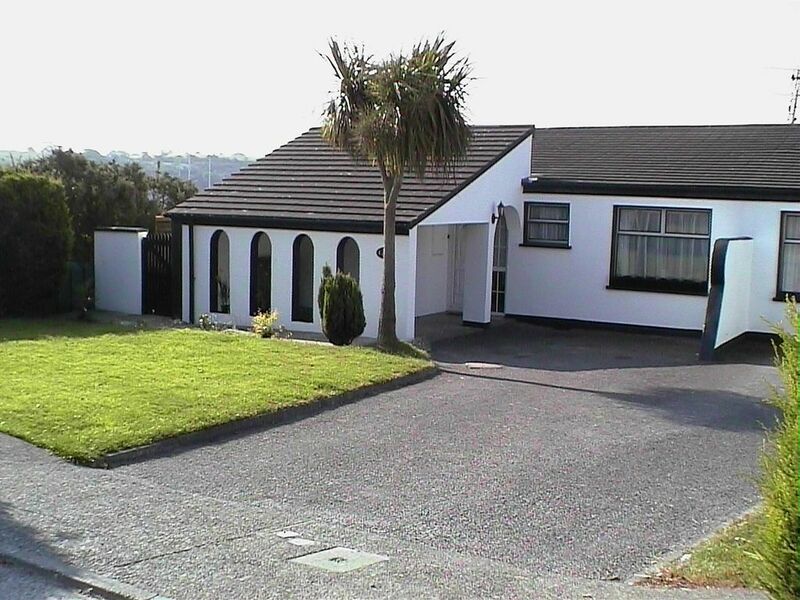 Three bedroom bungalow sleeping 5 in an ideal part of Kinsale. Beautifully decorated and furnished to a very high standard with all amenities. The quaint, picturesque, bustling little streets of kinsale, the shops, cafes, pubs and restaurants, the harbour, marina area and fishing boats are all right on your doorstep, less than 5 minutes walk away. Kinsale enjoys a growing reputation as the gourmet centre of Ireland. Live music can also be heard from many a pub as you walk along Kinsale's streets. An ideal location for sailing, golf, and fishing, Kinsale has a yachting harbour, sailing club and three golf courses. Not only do Kinsale's glorious beaches, coves and inlets make it one of the most popular bathing, snorkelling and surfing areas in Ireland, the waterfront is also a launching post for deep-sea angling, scuba diving and blue-shark fishing trips. The West Cork coast is a haven for sea birds too and the Camogue Marsh and wildlife sanctuary can be seen from the rear of the house. Garden, Wifi, TV, DVD Player, Stereo. My wife, Mary and myself, Graham Hewitt, have a business in Leicestershire. We also live in Leicestershire and visit the house in Kinsale as often as we can. My wife, Mary, is Irish and comes from nearby Bandon. When she was a little girl she often used to visit Kinsale with her family. It was her ambition to have a house in Kinsale one day. That dream came true in 2003. We love the position of the property, being near to the centre. Also the garden and view. I find Kinsale a magical place. Not too big and not too small. Nice and friendly local people. There's a good variety of pubs/restaurants serving high quality food. We love to watch live music and there is plenty to choose from in Kinsale. Our house is in an ideal location being in a residential area and just 5 minutes walk to the centre. It also has great views and a nice garden. Large lounge with French doors to rear garden. Leather 3 piece suite, TV, DVD player, Stereo.. Kitchen has French doors to garden, table and 6 chairs, cooker, hob, fridge, freezer, washing machine, dishwasher and microwave. Dining Kitchen with French doors to terrace/garden. Kinsale Golf club has 2 courses, the rolling fairways of Farrangalway and the slopes running into the water at Ringenane. Both offer a different experience. Also, nearby is the spectacular and world famous Old Head Golf Links. Please contact owner for weblink addresses. Notes on accommodation: Quality furnishings, comfortable beds, central heating for colder periods. Outside: Front garden and good sized south facing rear garden laid mainly to lawn. Large patio area. Great views over Bandon River just before it enters Kinsale harbour. Camogue Marsh and wildlife sanctuary can be also be seen from the patio and from the kitchen and lounge through the patio doors to both rooms. Views over rolling hills beyond. Cleaning / Towels / Linen / Maid service: Linen and towels are provided. Cleaning and garden maintenance is carried out prior to guest arrival. Most enjoyable stay, thank you. Thanks George for your great review. Mary and I are glad that you enjoyed the house and your stay in Kinsale. It was lovely to have you stay at our house and you would be welcome to return at any time in the future. This gem was the perfect place and the perfect space for our family of five. We’ve come to really appreciate a “home” base to come to back to every night and this home fit the bill for us perfectly. We struggled a bit finding it and you have to wind through some pretty narrow streets but that just added to the charm. The walk into the town center is not bad at all but we were thankful for GPS to help us around. Kinsale is full of wonderful restaurants and we enjoyed a plethora of fresh fish. It’s also a great base to explore County Cork and beyond. I can’t recommend 21 River Meadows highly enough. We were so comfortable there. We hope to use this home repeatedly as our daughter is now living in Cork City and Kinsale fits the bill for us in terms of being out of the city but not too far from it. It’s only a half hour drive to the Cork airport which made it even better for us. Many thanks to Graham for making this the perfect home for us. Thank you for your nice comments and we're so glad that you enjoyed your stay. You're most welcome to return any time. Thank you for your review Ian. Mary and I are glad that you enjoyed your holiday and we look forward to your return. This was an extremely wonderful house, very roomy and well appointed. The owner, Graham, was very responsive to my questions before our stay, and remained available throughout. The house was in a pleasant residential neighborhood a 10-minute walk from downtown Kinsale. We could have used a few more instructions on how the appliances worked, but we figured them out without having to call Graham. The only shortage we found in the kitchen was water glasses. There were only two. Our deposit refund came expeditiously, and the payments were handled timely and professionally. We would definitely stay at this property again if we were to visit Kinsale a second time. Thank you so much for your review. I'm glad that you enjoyed your holiday. We love to hear that our guests have enjoyed their stay at the house. It makes our efforts worthwhile. There should have been more water glasses and I will make sure that we purchase some more. I will be in Kinsale in a couple of weeks and I will review the appliance instructions. If you come back to Kinsale any time you would be welcome to stay at Rivermeadows again. We have just had a lovely week in Kinsale. The house was perfect for us. We have 4 children between the ages of 1 and 9, and there was plenty of bedroom and living space for all of us (the youngest in the travel cot provided). There is also a large, enclosed garden, perfect for children. The walk into town is also short, and again, easy with the children. Surfing in Garrettstown was the highlight of our week. Thanks to Graham and his wife for a lovely stay in their house. Thanks Lucy for your lovely review. I'm really glad that you all enjoyed the house and your holiday. We have quite a lot of information at the house regarding interesting things to do in and around the Kinsale area and beyond. However, i have to admit that surfing in Garrettstown is something i didn't know about. Well done, and I'm glad you had a great time. You and your family would be welcome to return at any time in the future. Perfect place to stay for a family of five like us. A short walk to the charming town centre of Kinsale (don't take your car down there if you don't need to on busy summer days, streets are narrow and cars parked everywhere). We found everything we needed for self-household in this bungalow, and spent hours relaxing in the back garden. Clean and nice, and enough wardrobe space for everybody. We spent a week in Kinsale, and had several day-trips from here, the longest to the lovely Dingle peninsula and also one along the south coast to Mizen Head via several attractions like the Michael Collins centre and the model railway near Clonakilty, numerous acheological sites, the planetarium in Schull and generally the coastal landscape itself. Thank you for your review. I'm so glad that you enjoyed your stay. You'd be most welcome to return if you come back to Kinsale in the future. Regarding the hot water in the kitchen, you just need to let the tap run for a bit and the water will be hot. Kinsale has a glorious sandy beach on the other side of the harbour 5-10 minutes drive away. Cork Airport is approx 30 minutes drive from Kinsale as is the nearest ferry port. Car hire is not essential as the house is a taxi ride from the airport and only 5 minutes walk from Kinsale Centre. However, West Cork is a beautiful area and is certainly worth exploring by car. Kinsale has many shops with all trades covered and the Supervalue supermarket is very handy in the centre. There are many restaurants with very high quality food in this gourmet capital of Ireland. The South West corner of Ireland is known for it's beauty and dramatic coastline. There are many places of interest to visit and only a few are mentioned here. Cork City is within 30 minutes drive of Kinsale and is a thriving, vibrant place. Standing on the banks of the River Lee it is the second largest City in Southern Ireland and owes it's origins to St. Finbarr who founded a monastry there in the 6th Century. Clonakilty (home of the famous black and white pudding), Skibbereen, Glengarriff, Killarney, Bantry and Blarney are all within sightseeing distance of Kinsale. As is the Ring of Kerry, including the beautiful lakes, Gap of Dunloe etc. Cobh, the last port of call of the Titanic, is well worth a visit. The Heritage Centre tells the story of emigration from Cobh in the period of the famine in 1845 up to the era of the great Liners in the 1950s. The historical role which Cobh harbour has played as a port is also illustrated. Booking Notes: A 10% deposit secures a booking. The balance then being due 8 weeks prior to arrival. A £50 per week refundable security deposit is taken. Changeover Day: Changeover day is Saturday. Arrival is from 4pm and departure is by 10am.